For other uses, see Richard Poore (disambiguation). Sculpture on the west front of Salisbury Cathedral of Richard Poore, holding a model of the Cathedral in his hand. Richard Poore or Poor (died 15 April 1237) was a medieval English clergyman best known for his role in the establishment of modern Salisbury and its cathedral at their present location, away from the fortress at Old Sarum. Poore was probably the son of Richard of Ilchester, also known as Richard Toclive, who served as Bishop of Winchester. He was the brother of Herbert Poore, who served as bishop of Salisbury from 1194 to 1217. Richard studied under Stephen Langton at Paris. Richard Poore became Dean of Salisbury in 1197, and unsuccessfully was nominated to the see of Winchester in 1205 and attained the see of Durham in 1213. His election to Durham was disallowed by Pope Innocent III before it was made public, probably because the pope knew that King John wished for the translation of his advisor John de Gray from the see of Norwich to Durham. During the interdict on England during King John's reign, Richard returned to Paris to teach until the interdict was lifted. It was probably during these years before Poore held an episcopal office that he completed Osmund's Institutio, as well as his own works the Ordinale and the Consuetudinarium. The Institutio detailed the duties of the cathedral clergy at Salisbury, along with their rights. The Ordinale covered the liturgy, and how the various specialised services interacted with the basic divine service. The last work, the Consuetudinarium, gave the customs of Salisbury itself. Both the Consuetudinarium and the Ordinale were basically guides to the Sarum Rite, the usual form of liturgy in thirteenth century England. While he was dean, he also encouraged Robert of Flamborough to write a penitential. Poore was Bishop of Chichester in 1215, being elected about 7 January and consecrated on 25 January at Reading. He attended the Fourth Lateran Council in 1215. He also served as one of the executors of King John's estate. Poore's brother, Herbert Poore, died in 1217, and Richard succeeded to his position as Bishop of Salisbury by 27 June. He owed his move to the see of Salisbury to the papal legate, Cardinal Guala Bicchieri. It was during this time that he oversaw and helped plan the construction of the new Salisbury Cathedral as a replacement for the old cathedral at Old Sarum. He also laid out the town of Salisbury in 1219, to allow the workers building the cathedral a less cramped town than the old garrison town at Old Sarum. The cathedral, however, was not dedicated until 1258. It was while Poore was at Salisbury that he issued his Statutes of Durham, which derived their name from the fact that he reissued them after being moved to the see of Durham. These statutes were influential on many other episcopal legislation. He also welcomed the first Franciscan friars to Salisbury around 1225. He also served as a royal justice in 1218 and 1219. In 1223, with the fall from power of Peter des Roches bishop of Winchester, Ranulph earl of Chester, and Falkes de Breauté, Richard helped Hubert de Burgh take over the government, along with Stephen Langton and Jocelin of Wells bishop of Bath and Wells. The four men worked together to govern England for the next five years. 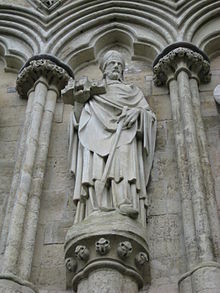 While Poore was at Salisbury, he took part in the translation of St Wulfstan's in 1218, and in the translation of Saint Thomas Becket's relics in 1220. At the later event, he was the only other bishop besides Stephen Langton to actually examine Becket's body. Richard also petitioned Pope Gregory IX to have the first bishop of Salisbury, Osmund de Sees canonized, but was unsuccessful. Osmund was eventually made a saint in 1457. Poore was translated to the see of Durham on 14 May 1228. With his move to Durham, he withdrew from royal service, although he was briefly back in service when Peter des Roches returned to power in late 1232 and early 1233. At Durham, he inherited a quarrel between the bishop and the cathedral chapter that mainly involved the election of the prior and the right of the bishop to undertake visitations of the priory. The quarrel had begun under Richard Marsh, and had led to appeals to the papal curia from the monks. Soon after coming to Durham, Richard issued a set of detailed constitutions that governed many of the relations between the bishop, the prior, and the cathedral chapter that was the basis of church government in Durham until the Dissolution of the monasteries under King Henry VIII of England. In 1220, while Poore was bishop of Salisbury, he ordered his clergy to instruct a few children so that the children might in turn teach the rest of the children in basic church doctrine and prayers. He also had the clergy preach every Sunday that children should not be left alone in a house with a fire or water. Also during his time in Salisbury, he promoted the education of boys by endowing some schoolmasters with benefices provided they did not charge for instruction. In 1237, Richard established a retirement house for the old and infirm clergy of the diocese of Durham. Richard was also an opponent of pluralism, the holding of more than one benefice at the same time. He not only held that a clerk receiving a new benefice should give up the old one, but that if the clerk protested about the loss, he should lose both benefices. He also decreed that the clergy should not be involved in "worldly business". Poore House at Bishop Wordsworth's School, Salisbury is named in honour of his legacy to Salisbury schools. Poore died on 15 April 1237 at the manor of Tarrant Keyneston in Dorset. His tomb was claimed for both Durham and Salisbury, but most likely he was buried in the church at Tarrant Keyneston which was what he had wished. He is commemorated with a statue in niche 170 on the west front of Salisbury Cathedral. ^ British History Online Bishops of Salisbury. Retrieved 30 October 2007. ^ a b British History Online Deans of Salisbury. Retrieved 30 October 2007. ^ British History Online Bishops of Winchester. Retrieved 2 November 2007. ^ British History Online Bishops of Durham. Retrieved 25 October 2007. ^ British History Online Bishops of Chichester. Retrieved 20 October 2007. This page is based on the Wikipedia article Richard Poore; it is used under the Creative Commons Attribution-ShareAlike 3.0 Unported License (CC-BY-SA). You may redistribute it, verbatim or modified, providing that you comply with the terms of the CC-BY-SA.